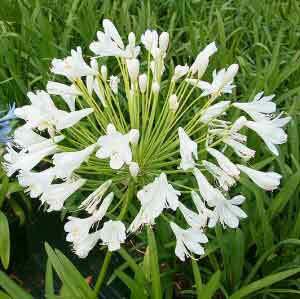 This is a dwarf variety of the agapanthus and is known for it's long lasting flower heads and and its compact form. Beautiful white heads of flowers all through the summer months. Ideal for pots, borders, rockeries, along driveways and for mass planting under trees. Height to 40cm. Width to 40cm.